Because I will be in Germany for six weeks in September and October, I will have to skip one month. So, I will leave this issue on the web site until mid September, and the September will remain up until November. There will be no "October" or "Vol. 13 # 10" posting. This month a "Feuerwache" (fire department building) by Ernst Meyer-Margreth is featured on the "builders page". AV Burkhard Schulz has drawn up the plans. They are available on the web in the PDF format from ankerstein.ch/downloads. I built it to check the plans for errors (there were none) and to have a building for the August web page. The building is large -- 1025 × 438 mm. New cat pictures. Abbie II in person! Here are the pictures of me and my cats. I plan to be at both the Treffen at the new factory in Rudolstadt on September 20th and at the CVA meeting on October 25th. Since two round trips to Europe in two months is just more traveling than I like, I will be at R28 in Den Haag for the interim period. 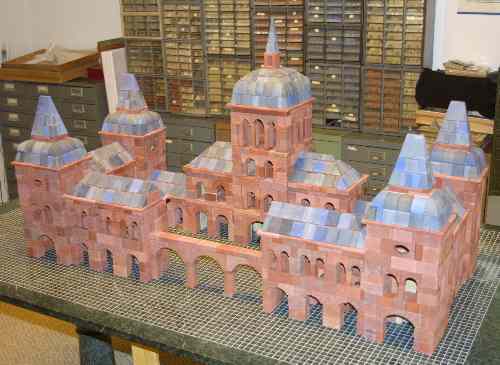 At present I plan to build the Large Castle (Grosse Burg) using the AF set from the new factory. Of course that might not happen. I have learned long ago not to make too many firm plans during Anchor trips. AV William Seppeler has established an important web site/blog which provides designs for small sets and collections. If you have just a set # 6, or the even smaller Brownie (Heinzelmännchen), you must check out this side. In fact, all Anchor builders should look at it to see just how much variation is possible to a designer with a great imagination. New plans for set # 4 are on the site. The Richter villa is going to be closed. The Spielhausverein must move, and the villa is to be sold. But irrespective of whether or not it is sold, it is now closed to the public, except by appointment. The city is worried about its physical condition and safety. I am worried about all of the Anchor archive materials being housed there and about the large collection of old Anchor stones, many of which are quite rare. We'll see what happens, but if you want to see the villa, you had better hurry! All sets -- #s 6 through 28A, and the NS conversion set -- are now in stock! One of the two sets previously not available at retail is now being offered here in the USA. The set is a Conversion Set (Übergangskasten) from the NF series to the NS series. This set contains all of the special arches and extra stones needed to build the NS designs through set NS 18. The plans are supplied on CD-ROM, not printed out. Since these arches did not fill a box, the factory has added a well thought out selection of filler stones to make up a complete box of stones. New NS buildings are being designed by AVs today and are available on the web in the form of PDF files from the factory's web site. -- either here or in Europe. The Mosaic Set is still not available here in the USA. This set contains 547 stones in four colors and is intended for floors in Anchor buildings. The set is identical to the set Mosaik Set # 4 from the original factory. 547 stones means that the set is expensive, but Anchor buildings look very nice when they have floors on the porches and entrances. For those of you who are interested, here is a picture of me and my cats. Yes, I have two new (to me) cats. Both "seniors" and both from Caring for Creatures, a local no-kill animal shelter. Pictures as they are taken. My picture was taken about four years ago, during my 67 birthday party. AV Rob Buis has been producing reproduction metal parts (listed here) of the highest quality. To find out which ones are still available you should e-mail AV Rob Buis. Yes, they are expensive, but if you want to build Anchor bridges using nickel-plated iron parts, you will find that most of the original parts are rusted, often bent, and very hard to use. I build with Rob's parts. Contact Rob for more information about his new Anchor metal parts. Rob is setting up a web site for his reproduction metal parts. He has also established a web site for box # 10 and box # 10B. I have received the new, 2008, price list. Prices have gone up because of the weak US$. The new prices for all of sets are found on the new sets page. The Euro is even stronger against the US$ than before. I have been forced to adjust prices. The new prices are now on the new sets page. The last CVA meeting was on Saturday, April 12, 2008. The next meeting date will be on Saturday, October 25, 2008. I hope you will be there. I am planning to be there. In addition the new Anchor factory in Rudolstadt, Germany has scheduled three "Treffen", or "open door" days, at that factory for 2008 -- Saturday, July 5th; Saturday, September 20th; Saturday, December 13. I plan to attend the September 20, 2008 Treffen. See the CVA page for details. For the month of August, 2008.